Back in October of last year, Flickr introduced an option to create a new Flickr user account by linking it to a Google ID. This made the signup process more comfortable for users with a Google ID, since they did not have to create a Yahoo ID to use the service. Yesterday Flickr announced that they have extended the feature to allow all users, new and existing, to sign in to the service with either a Google ID or Facebook ID. What does it mean? It means that it is now possible to link a Flickr account to either a Google or Facebook account and use the information from that account to log in from then on. Flickr users who do not use other Yahoo services can effectively remove the Yahoo account from the list of active accounts, if they choose to do so. All that needs to be done is to click on the Facebook or Google button on the Flickr sign in page. This opens the login prompt of the selected service where users need to enter their username and password. 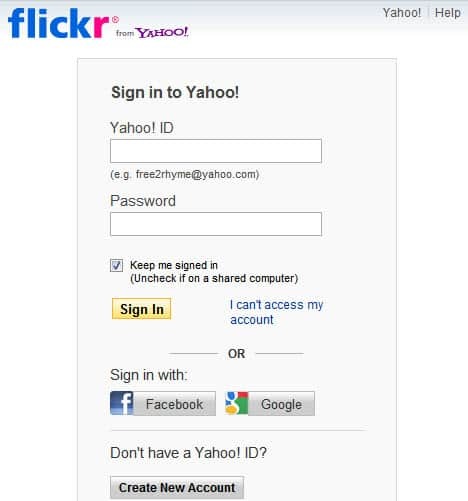 They then need to select Sign In to connected on the next step to link the Yahoo account with the selected account on Facebook or Flickr. Sign out of Flickr from the top right of any page. You will see Google & Facebook sign-in buttons. If you don't see them click "Sign in with another account"
Enter your Google or Facebook login info. Now you should see this screen to enter your Yahoo! ID. The Flickr team has added another interesting option. Flickr users who use Facebook or Google as their login ID can share their public photos automatically on Facebook when they upload them to Flickr. Users who like the option need to configure the connection with Facebook in the Flickr account settings. Thanks for heads up. This is helpful. I wanna sign in from another laptop on my account. But everytime I try to login he tries to get me signed up. While I already have an account. Even when I try to login via facebook. I have already in account so provide me new google account.thanks.